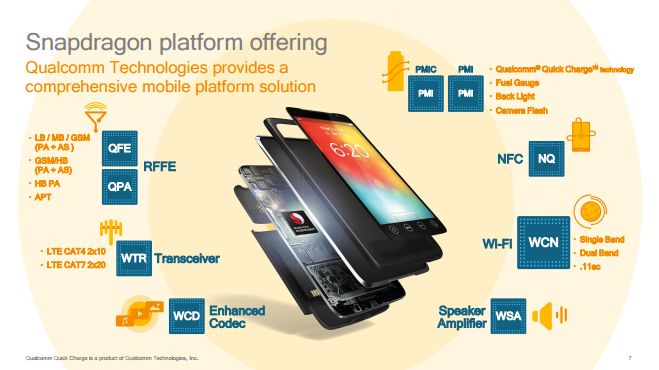 New Snapdragon chipsets are announced by Qualcomm in its Snapdragon 600 and 400 tiers: 653, 626 and 427. The three new mid-range chipsets has been an improved and interesting attempt from the San Diego- based company. All the three chipsets acquire a new X9 LTE modem and support for Quick charge 3.0 and dual cameras. The chipsets support dual camera and thus will provide better imaging overalls, across the mid-segment Smartphones. The new X9 LTE supports Cat 7 downlink speeds of up to 300Mbps and Cat 13 uplink speeds of up to 150 Mbps. LTE improved Carrier Aggregation support is up to 2sx 20MHz in both download and uplink, 64-QAM in uplink. The VoLTE support comes with the Enhanced Voice Services codec which will allow better call clarity and reliability. Snapdragon 653 is the most powerful chipset among the three. Qualcomm claims that it is expected to perform 10% better than the 652. It has a clock speed of 1.95 GHz support for up to 8GB of RAM and preferable GPU performance. The Snapdragon 626 is also anticipated to be 10% better than its predecessor. It clocks up to 2.2GHz. It also adds Qualcomm’s TruSignal antenna boost which offers improved signal reception in cram-full areas. And 427 is visibly the less improved version. CPU and GPU performance is indeed better than previous one and clock speed remain same when compared to 425 i.e up to 1.4GHz. The X9 LTE is seemingly the huge difference with 425. It also gets TruSignal antenna boost. When comes to availability, 653 and 626 is anticipated to strike the market by end of this year and 427 by early 2017.